When we invest in a SaaS startup, which almost always happens at the seed stage, the next big milestone on the company’s roadmap is usually a Series A. If you carry this thought further and assume that the biggest goal after the Series A is to get to the Series B (and so on, you get the idea) it sounds like turtles all the way down. But financing rounds are obviously not a goal in itself. They are a means to a bigger goal. 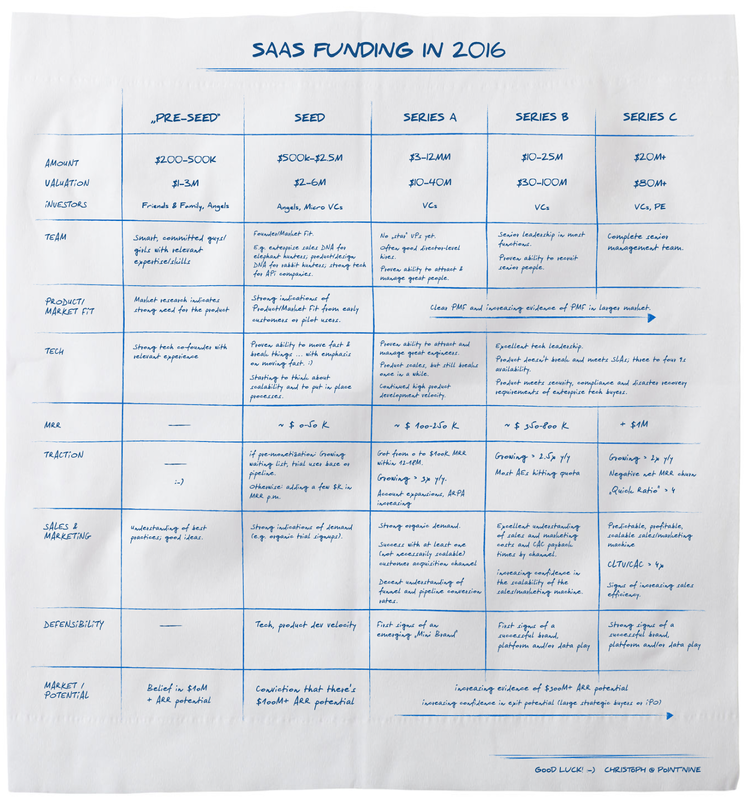 Some SaaS companies got big without raising a lot of capital – Atlassian, Basecamp and Veeva are probably the most famous examples. But they are exceptions, not the rule. According to this analysis of Tomasz Tunguz, the median SaaS company raises $88M before IPO. 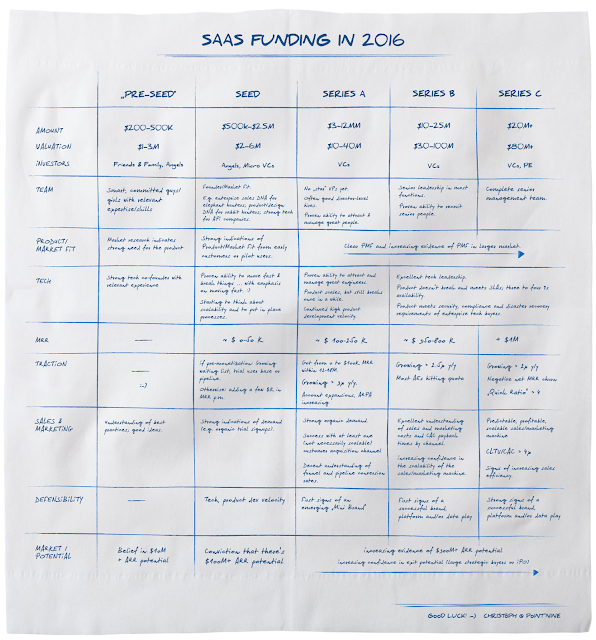 So what does it take to raise money for a SaaS company in 2016? With constantly rising table stakes and a fundraising environment that looks quite a bit less favorable than last year’s, I believe the bar is higher than in the last 18-24 months (although raising money is still much easier than it was in “Silicon Valley’s nuclear winter” in 2008). Below is my back of a (slightly bigger) napkin answer to this question. The assumption of the information in the table is that the founding team is relatively “unproven”. Founding teams with previous large exits under their belts can raise large seed rounds at very high valuations on the back of their track records and a Powerpoint Keynote presentation. Some of the information is tailored to enterprise-y SaaS companies. If you have a viral product (like Typeform or infogram), some of the “rules” don’t apply. PS: Thanks to Jason M. Lemkin, Tomasz Tunguz, Nicolas Wittenborn and my colleagues at Point Nine for reviewing a draft of this post!